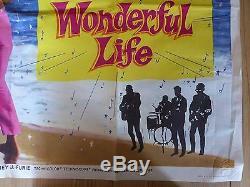 Wonderful Life' (1964) original UK quad poster (40"x30"). 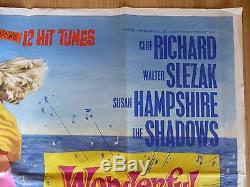 Music comedy with Cliff Richard and Susan Hampshire. This poster has 2 very small repaired tears to the edge (both less than 1cm). It also has acid-free archival tape to the back of the 3 crossfolds but there is no separation there, I added it to prevent damage when it was folded but have kept it stored rolled for a couple of years now. There is slight creasing and a small patch of discolouration at the bottom centre in the white border. Overall though this poster is in excellent condition with strong colours. A rare original 1964 quad. Add me to your Favourites list. 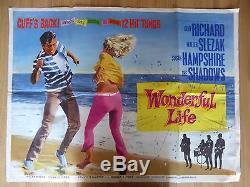 The item "WONDERFUL LIFE (1964) original UK quad film/movie poster, Cliff Richard, music" is in sale since Monday, January 30, 2017. This item is in the category "DVDs, Films & TV\Film Memorabilia\Posters\Originals - UK Quads\Pre-1970". The seller is "richposters" and is located in Warrington. This item can be shipped worldwide.